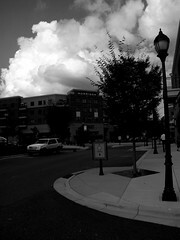 For the last couple of days the sky in Charlotte has been beautiful. A new thing on Flickr is the Flickr Gallery. You can assemble photographs by other people into a gallery which you can then share. It's pretty cool. I assembled a few racing pictures I have favorited over the years into a gallery which you can view here. Walter: I've just been signed to play DT for the Panthers. me: That's a death sentence. You'll be walking on an artificial knee in two months. Walter: It's like fighting Mike Tyson during his prime...I may get close to death, but I'll get well compensated for it. I'm sure I'm not the only person that has done this. Whenever I am bidding on something I really want on eBay and I get outbid I will make one more bid just to make sure the guy that beat me has to pay a dollar two more. I'm sure the other bidder doesn't notice but it makes me feel better. I have found that generally when you get outbid on eBay that the other person's maximum bid will be more than 99 cents more than your highest bid. So if you make one more bid just for petty revenge you are pretty safe and you won't have to buy the item, just drive up the other guy's price. Sometimes this will backfire and you'll end up winning, which is OK because it's only one dollar more than you were previously willing to spend. The best result is that you'll be highest bidder for a little while until the other guy, if he wants the item more than you, logs back on and makes another bid. That's a double win for you because you not only are forcing him to pay more buy you are siphoning away his valuable time when he logs on and bids again. Take that! After years of holding out I finally listened Harry Potter and the Sorcerer's Stone. Melanie and I listened to it while driving around Lake Michigan during out August vacation. J.K. Rowling and David Sedaris were the two authors we agreed that we both would enjoy. I'm glad I entered the book version of the Harry Potter stories in the audio format because I probably wouldn't have finished this book if I had been reading it myself. It was an enjoyable time passer in a car going down an interstate but it's not something I would spend hours on in my reading chair. Honestly, it wasn't that great. There were a few scenes that were wonderful and there are some great characters but as an overall work it was a little weak. The plot twist at the end was cheap and the universe she created has a lot of holes in it. She never really reconciled to me the problem in the Harry Potter universe: the disconnect between the world of the Muggles and the world of the wizards and witches. The reader, Jim Dale, did a marvelous job bringing the book to life, although the voice he adopted for Hermione caused me to laugh a couple of times. I did notice that his performance was recorded before the movies were made and the characters Professor McGonagall and Hagrid sound almost identical to how they sound in the films. If I remember correctly the audio book was recorded well before the first film was made. I wonder how much he inspired the creation of the characters vocal styles for the film? Wow, I guess the 12th of September would have been a good day to go to Wal-Mart because, judging from this slideshow Wal-Mart's usual shoppers were in Washington D.C. this weekend. Wow, you know, I do get homesick sometimes but the Panthers don't have to play like the Lions just to make me feel more at home. Or, as the Charlotte Observer put it, the Panthers were back in playoff form yesterday. I've been saying ever since his meltdown in Seattle in the playoffs in January of 2006 that Jake Delhomme isn't the answer at quarterback. He's a legitimate NFL quarterback and he's won us some big games with just his guts but I think it's over now. Sure, he was facing a touch rush yesterday and anybody would have had a bad day but even when he had an open receiver and time to throw he threw well behind his intended target. When the team was falling behind he tried to force a pass to Steve Smith that was sad to watch and later, during that screen play, he threw blindly into traffic. He's got the tools to be a great quarterback but I think he's had his shot. I don't care if they start Moore or McCown just as long as they don't start Jake. Make him sit out like McNabb did last year and maybe he'll come back pissed off and fired up. I'd love to see that. I'd love to see the old Jake who was a gamer and a winner. What is going on now on the field is just depressing. I haven't posted any Flick finds in a while. 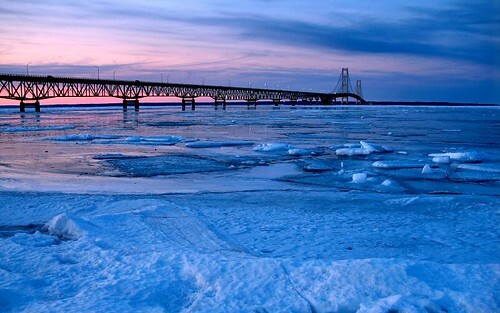 I've been on a Mackinac Bridge kick for the last couple of weeks. 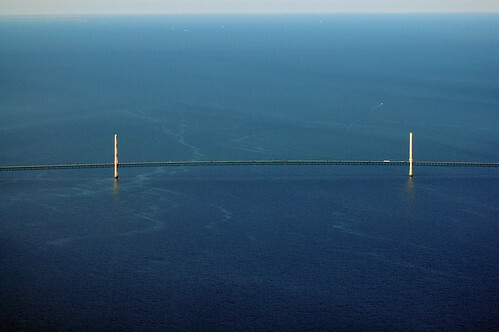 A great aerial shot of the Mackinac Bridge. 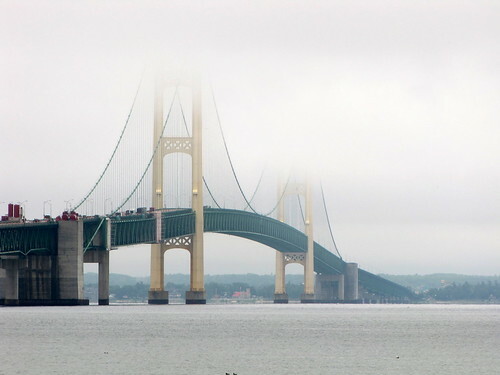 What I hoped to see but didn't, a freighter passing under the bridge. 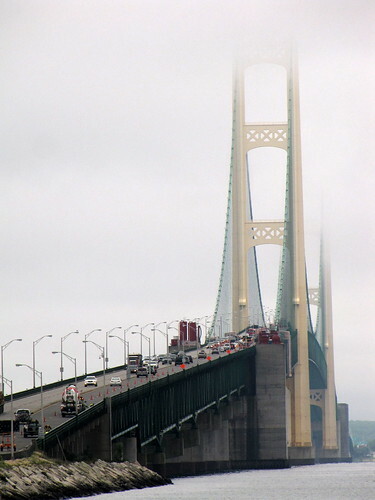 This is a shot Melanie took as we were approaching the bridge from the north. 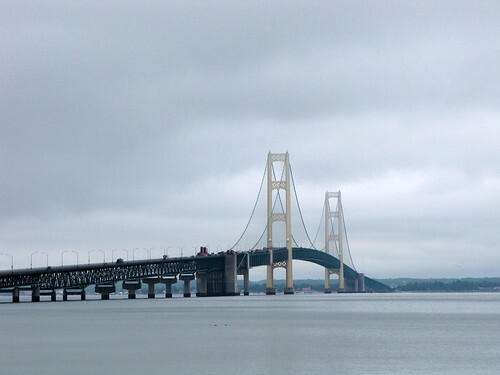 I think it does a good job showing the giganticness of the bridge. 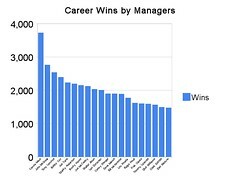 I give you a chart showing the number of wins for the top twenty on the all time win list for Major League managers. This is important stuff. This morning I ran by the local video game store (Game Stop) and picked up a copy of the Beatles Rock Band game. Early review: pretty cool, great music, killer graphics, music creatively remixed and an overall fun experience. One odd thing about the game that I find distracting: when you do well and get a multiplier the game makes a sound that is not unlike a Nazgul. It's kind of freaking me out. I think it needs a patch that will replace the Nazgul sound with something less scary. 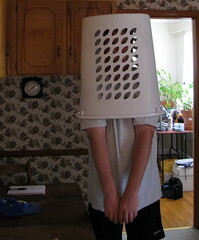 I spent my Labor Day trapped in a laundry basket. Thank goodness Melanie was there to help me out. My favorite bogus argument over health care is the socialism garbage. This from a county that has public roads, public transportation, publicly funded arenas for professional sports teams, publicly funded airports, medicare, social security, unemployment insurance, publicly funded schooling from K through PHDs and publicly funded public libraries but publicly funded health care would turn us into the USSR. What a joke, it's all about the insurance companies losing their profits. It's sickening. The morning after we camped at the KOA campground west of St. Ignace in Michigan's upper peninsula we made breakfast, packed up camp and headed south to the Traverse area. 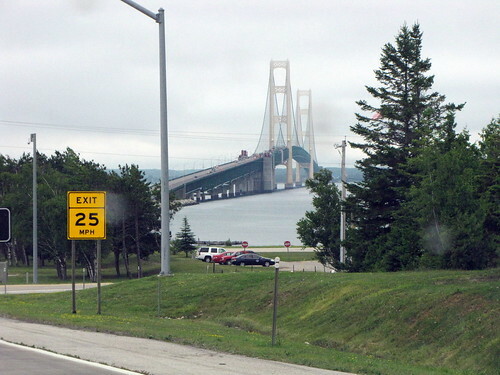 Before we crossed the Mackinac Bridge I got directions to a park where you could take bridges of the bridge. I'm happy with how these turned out.